So far in this series, we have talked about natural selection, sexual selection, genetic drift, and mutations, but that still leaves us with one final and very important evolutionary mechanism: gene flow. This simply refers to the movement of genetic information among populations (migration, for example, causes gene flow). At the surface, that may sound quite simple and boring, but it is actually fascinating, complex, and immensely important. For example, gene flow often plays a critical role in determining whether or not an organism will speciate (i.e., split into two species). Similarly, gene flow interacts with genetic drift and selection, and low levels of gene flow may predispose a population for extinction, whereas high levels may be equally harmful by preventing a population from adapting. Therefore, in the final post of this series, I want to talk about gene flow and explain how it interacts with other evolutionary mechanisms and determines the fate of many populations. When we talk about gene flow, we are generally talking about the movement of genetic information from one population to another. This can occur either by individuals moving among populations (and mating) or by mechanisms that just transfer genetic material (e.g., wind and animals moving the seeds and pollen of plants). One of the most powerful traits of gene flow is its ability to prevent populations from splitting apart. If you recall from previous posts, selection and genetic drift are constantly shifting the allele frequencies of populations, but which allele becomes common can vary from one population to the next. Genet drift is, of course, random. Thus, for a given genetic locus, one allele might become common in one population, while becoming quite rare in another. Similarly, selection (which is non-random) simply adapts populations for their current environment. As such, we expect that two populations that are living in different habitats would be under different selection pressures and thus evolve in different directions. Finally, mutations randomly create new genetic information, so if a mutation occurs in population A but not in population B, that will result in yet another genetic difference between the two populations. The result of all of this is that when two populations are isolated, they both slowly accumulated genetic differences. Different mutations will arise in each one, different alleles will be selected for, and different alleles will be affected by genetic drift. Over many generations, these populations will eventually accumulate so many differences that we would consider them to be different species. This is called allopatric speciation (i.e., the formation of two new species from isolated populations). Gene flow can, however, counteract that process by moving genetic information from one population into another. Imagine, for example, that a new mutation arises in population A but not population B. However, in each generation, a large number of individuals migrate between the two populations. As a result, some of the individuals who have the mutation carry it with them into population B where they mate with individuals of that population and pass the mutation on. Similar patterns also occur with selection and drift (more on that in a minute). Gene flow constantly shuffles the genetic information around and causes alleles to be exchanged among populations. Thus, it mixes the populations together and can prevent them from splitting apart. Note: Although low levels of gene flow can be a very important driver of speciation, they are not required. There is also sympatric speciation which occurs when a connected population evolves in two separate directions and becomes two separate species (differences in mating patterns are a good way for this to happen). Gene flow is often extremely important for the long-term survival of a population, and maintaining gene flow is often a conservation priority. This is because gene flow is a powerful way to counteract genetic drift. If you remember from previous posts, genetic drift is constantly removing variation from a population, but that variation is important because it is what allows populations to cope with future changes to the environment, new diseases or predators, etc. Indeed, it is well established that genetically diverse populations are superior to low-diversity populations (Hedrick and Kalinowski 2000, Keller and Waller 2002, Reed and Frankham 2003, Spielman et al. 2004, Whiteman et al. 2006, Hughes et al. 2008). Additionally, in very small populations, genetic drift can actually overpower selection and cause harmful alleles to rise to prominence (Lacy, 1987; Whitlock, 2000; see this post). This shows gene flow’s ability to counteract genetic drift. In the top panel (A) there is no gene flow, and alleles became fixed in each population by 200 generations. In contrast, in the lower panel (B) there is gene flow, and alleles never stay fixed. Thus, gene flow allowed the populations to maintain a higher diversity. Gene flow can, however, counteract this by constantly restocking the genetic diversity of a population. Consider the examples illustrated on the left. In the top example, I simulated the frequency of a given allele in10 populations of 25 individuals. At the start of each simulation, the allele had a frequency of 50% and there was no selection. In the first set of 10 populations, there was no gene flow, and you can see that the frequency of that allele changed randomly (sometimes increasing, sometimes decreasing), and by 200 generations, in each population it had either become fixed (i.e. everyone had it and the alternative allele was lost) or it was totally removed from the population. In other words, in every case, diversity was lost because of genetic drift. Now, look at the second set of 10 populations (bottom). That simulation was set up identically, but at the start of each generation, I had one individual immigrate from a large neighboring population that had an allele frequency of 50% for the allele in question. As you can see, neither allele ever becomes fixed for more than a few generations, because even if one is lost, gene flow reintroduces it. Thus, the populations maintain a higher diversity than they would without gene flow. Gene flow can also cause something called the “rescue effect.” Many things such as disease outbreaks, over-harvesting, natural disasters, etc. can cause populations to go through large genetic bottlenecks where they lose a large portion of their genetic diversity. That is very bad for them because, as mentioned earlier, diversity is important for the long-term survival of a population. Gene flow can, however, rescue those populations by resupplying them with some of the diversity that they had lost (Wright 1931, Slatkin 1985, 1987, Whiteley et al. 2015). In other words, if you have two neighboring populations, and one goes through a bottleneck while the other does not, the population that did not go through a bottleneck can rescue the bottlenecked population via gene flow. When gene flow interacts with genetic drift, it is usually beneficial, but when it interacts with selection, it can be very harmful, because it can introduce alleles that aren’t locally adaptive, and those alleles can swamp selection (García-Ramos and Kirkpatrick 1997, Lenormand 2002, Kawecki and Ebert 2004, Foster et al. 2007, Funk et al. 2012). Remember, selection just adapts populations for their current environment. So selection for a give trait may be strong in one population, but weak, non-existent, or even reversed in a neighboring population. As a result, selection may be acting to remove an allele from one population, while gene flow is constantly reintroducing that allele from a neighboring population where the allele is actually beneficial (or at least not harmful). This shows gene flow’s ability to counteract natural selection. In the top panel (A), there is no gene flow, and selection removes one allele from the population as expected. In contrast, in the lower panel (B) there is a high level of gene flow, and selection never manages to remove the harmful recessive allele from the populations. I simulated this and have presented the results on the right. The populations (top) were set up in exactly the same way as for my gene flow example, but this time, I added selection. Individuals that had the dominant phenotype had a 100% chance of surviving and reproducing, whereas individuals with the recessive phenotype only had a 90% chance (i.e., there was selection against the recessive allele). As you can see, selection quickly removed the recessive allele (thus the dominant allele had a 100% frequency after only a few generations). If I showed you the survivorship for these populations, you would also see that their survivorship has increased (i.e., they adapted). Now, let’s do the exact same thing, but let’s have one immigrant per generation, just like in the gene flow example (bottom). As with the gene flow, neither allele ever became fixed. The frequency of the beneficial dominant allele did shift up a bit from the starting point on average, but it never stayed at 100% like it did without gene flow because the gene flow was constantly reintroducing the harmful recessive allele. As a result, these populations could not adapt as well as the populations without gene flow, and they had a lower survivorship. This can be very problematic for populations, especially if they are being faced with something like an introduced disease. It is also a big concern for conservation efforts that move individuals among populations (thus creating artificial gene flow). 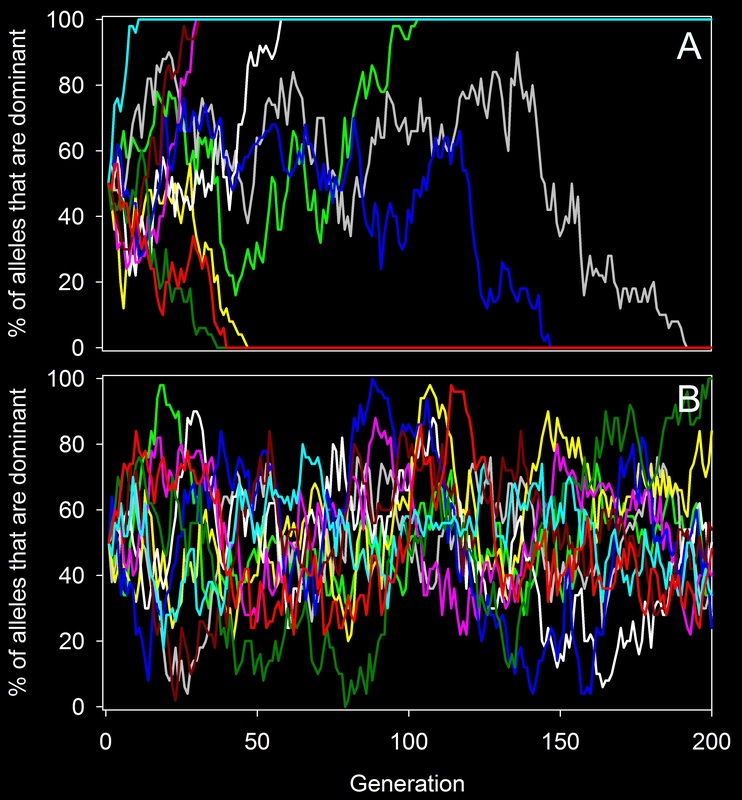 The flip side of that, however, is that you can, in concept, do targeted genw flow where you take individuals from a population that has a beneficial allele and move those into a population that would benefit from that allele (e.g., take individuals from a population that has adapted to a disease and move them into a population that is still declining from the disease; Kelly and Phillips 2015). In short, gene flow simply refers to the movement of genetic information among populations. It is an incredibly important evolutionary mechanism because it can prevent populations from splitting apart and it can counteract genetic drift and rescue low diversity populations. However, in some situations it can also counteract natural selection and flood a population with maladaptive alleles. Thus, although it is often beneficial, gene flow can be harmful in some situations. Foster, J. T., B. L. Woodworth, L. E. Eggert, P. J. Hart, D. Palmer, D. C. Duffy, and R. C. Fleischer. 2007. Genetic structure and evolved malaria resistance in Hawaiian honeycreepers. Molecular Ecology 16:4738–4746. Funk, W. C., J. K. McKay, P. A. Hohenlohe, and F. W. Allendorf. 2012. Harnessing genomics for delineating conservation units. Trends in Ecology and Evolution 27:489–496. García-Ramos, G., and M. Kirkpatrick. 1997. 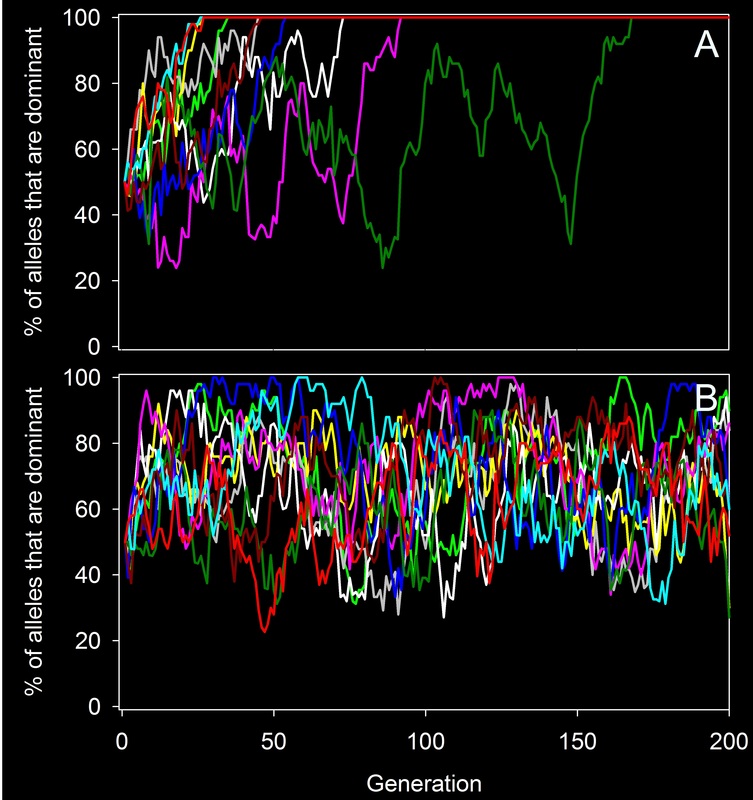 Genetic models of adaptation and gene flow in peripheral populations. Evolution 51:21–28. Hedrick, P. W., and S. T. Kalinowski. 2000. Inbreeding depression in conservation biology. Annual Review of Ecology and Systematics 31:139–162. Hughes, A. R., B. D. Inouye, M. T. J. Johnson, N. Underwood, and M. Vellend. 2008. Ecological consequences of genetic diversity. Ecology Letters 11:609–623. Kawecki, T. J., and D. Ebert. 2004. Conceptual issues in local adaptation. Ecology Letters 7:1225–1241. Keller, L. F., and D. M. Waller. 2002. Inbreeding effects in wild populations. Trends in Ecology and Evolution 17:230–241. Kelly, E., and B. L. Phillips. 2015. Targeted gene flow for conservation. Conservation Biology 30:259–267. Lacy, R. C. 1987. Loss of genetic diversity from managed populations: interacting effects of drift, mutation, immigration, selection, and population subdivision. Conservation Biology 1:143–158. Lenormand, T. 2002. Gene flow and the limits to natural selection. Trends in Ecology and Evolution 17:183–189. Reed, D. H., and R. Frankham. 2003. Correlation between fitness and genetic diversity. Conservation Biology 17:230–237. Slatkin, M. 1985. Gene flow in natural populations. Annual Review of Ecology and Systematics 16:393–430. Slatkin, M. 1987. Gene flow and the geographic structure of natural populations. Science 236:787–792. Spielman, D., B. W. Brook, D. A. Briscoe, and R. Frankham. 2004. Does inbreeding and loss of genetic diversity decrease disease resistance? Conservation Genetics 5:439–448. Whiteley, A. R., S. W. Fitzpatrick, W. C. Funk, and D. A. Tallmon. 2015. Genetic rescue to the rescue. Trends in Ecology and Evolution 30:42–49. Whiteman, N. K., K. D. Matson, J. L. Bollmer, and P. G. Parker. 2006. Disease ecology in the Galapagos hawk (Buteo galapagoensis): host genetic diversity, parasite load and natural antibodies. Proceedings of the Royal Society of London B: Biological Sciences 273:797–804. Whitlock, M. C. 2000. Fixation of new alleles and the extinction of small populations: drift load, beneficial alleles, and sexual selection. Evolution 54:1855–1861. Wright, S. 1931. Evolution in Mendelian populations. Genetics 16:97–159. This entry was posted in Uncategorized and tagged evolution, gene flow, genetic drift, mutations, natural selection. Bookmark the permalink. Overall excellent series. Hopefully these will help those who are willing to think.